To make white bread, food manufacturers remove the bran and wheat germ from wheat flour, and bleach it white using potassium bromate, benzoyl peroxide or chlorine dioxide gas. The question of which bread, white or brown, is healthier, depends on a variety of factors that are important to understand when you shop. Whole wheat brown bread has a “nutritional advantage” over white bread, according to the American Academy of Pediatrics. This is because brown breads made from whole wheat usually contain more fiber than white bread, as well as greater amounts of important nutrients such as vitamins B-6 and E, magnesium, folic acid, copper, zinc and manganese. Depending on the brand, however, this may not be the case, because many white breads come fortified with vitamins and fiber. White bread usually contains more calcium than brown bread. However, many manufacturers now fortify brown bread with calcium. The three chemicals used to bleach wheat flour from brown to white are potassium bromate, benzoyl peroxide and chlorine dioxide. Potassium bromate is dangerous if inhaled, swallowed or absorbed through the skin in large doses. Benzoyl peroxide, another bleaching agent, can be harmful to animals and cause low growth rate in plants, according to Green Living Tips. Chlorine dioxide doubles as a pesticide and many consider it a hazardous environmental product. 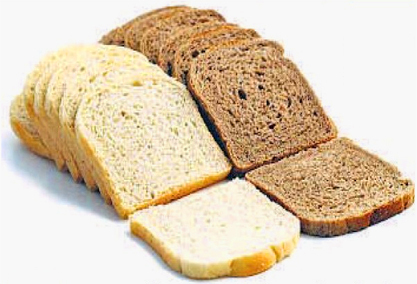 While all are dangerous in large quantities, manufacturers use small quantities when they bleach bread. Contrary to popular belief, brown bread doesn’t automatically translate to mean 100 percent whole wheat bread. To ensure you are buying the most nutritious bread option, read labels and check to see that the first ingredient listed is either whole wheat or “whole meal” flour. If the label reads “enriched,” the flour is the same as that for white bread. The presence of caramel as an ingredient often indicates bread coloring to darken white bread to brown. To ensure maximum nutrition and minimal additives, look for the bread product that contains the fewest number of ingredients. This, together with the presence of whole wheat or whole meal flour, is a sign that you are buying the healthiest bread available. Previous: Previous post: Big Mac and Fries….